Plate Activity Proves a Smash! During the winter school holidays, young visitors to the Museum Of Sydney were entertained with a 30 minute program inspired by the Celestial City exhibition. When looking for inspiration for storytelling and activities, they did not have to look far - the distinctive and intriguing willow pattern found on countless pieces of china was a hands-down winner. The Secrets of the Willow Pattern program proved a great success, judging by the busy and smiling faces of those who took part. The original willow pattern is said to have been first produced in England by Thomas Minton for Thomas Turner in Caughley, Shropshire around 1780, who was inspired by the blue and white oriental china being exported to Europe at the time. The design itself has inspired a romantic story with many different versions which all run along the lines of a young girl falling in love with a boy her powerful father disapproves off. She is then locked up, but the young lovers manage to exchange messages via some helpful doves and, after a chase across a bridge, manage to escape. They are later found out and their home is set alight to smoke them out, but they refuse to leave. It is then that the gods take pity on them and turn them both into doves. Depending on which version you read, they are either transformed before or after their deaths. 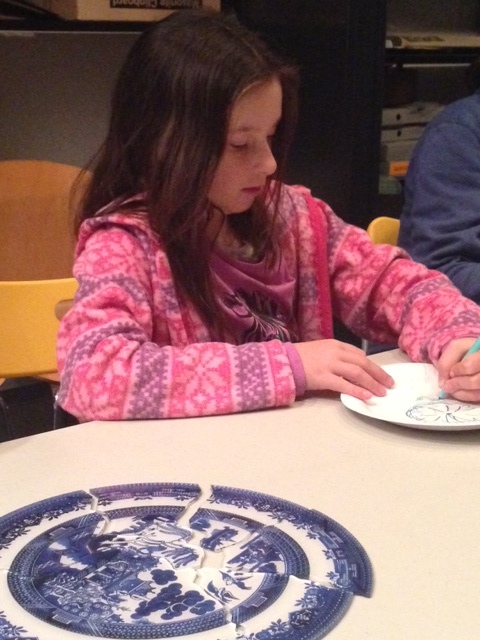 The Secrets of the Willow Pattern program is aimed at ages 5-10 and will be available during the September/October school holidays. 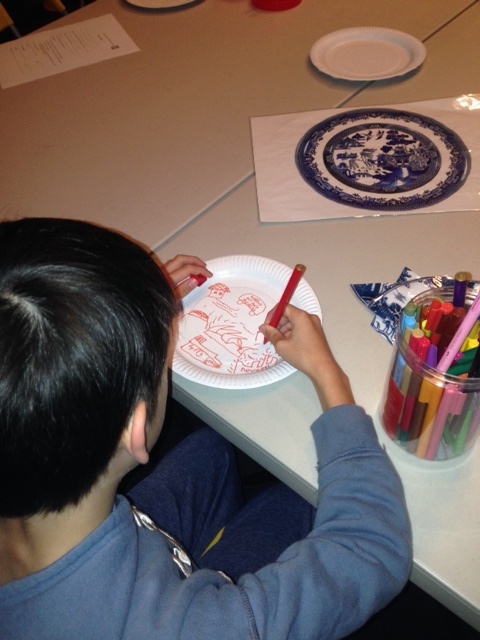 The program involves storytelling with visual aids, followed by a choice of activies including a puzzle and drawing the willow pattern design (or one of your own choosing) onto a paper plate. The most recent participants took up these activities with gusto and parents were well satisfied. Parents had the option of staying or leaving the children with us, but most with younger ones chose to stay, lending the activity a real family atmosphere. 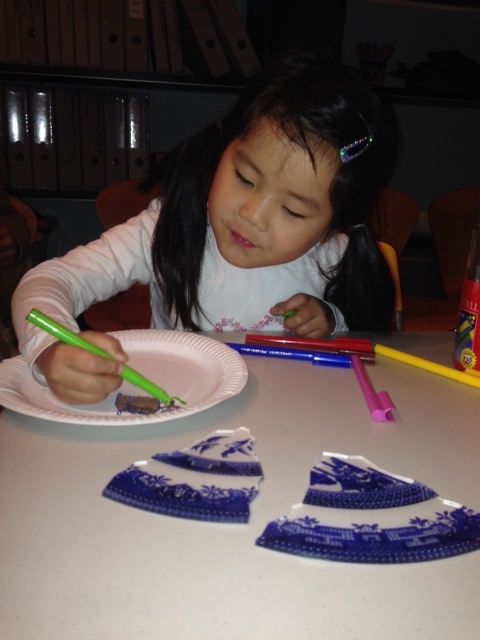 A girl puts the Willow Pattern puzzle together. 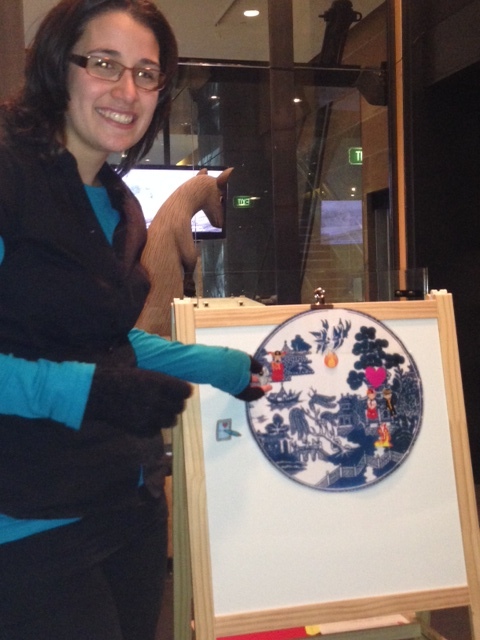 A girl drawing her story on a plate. A boy draws his own story onto a plate. 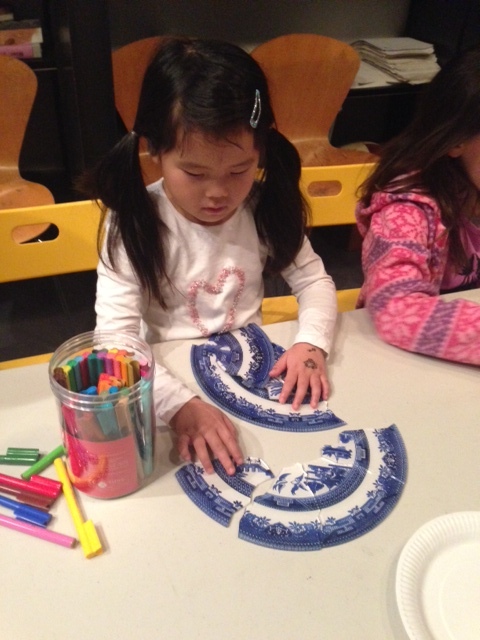 A girl is inspired by the Willow Pattern. 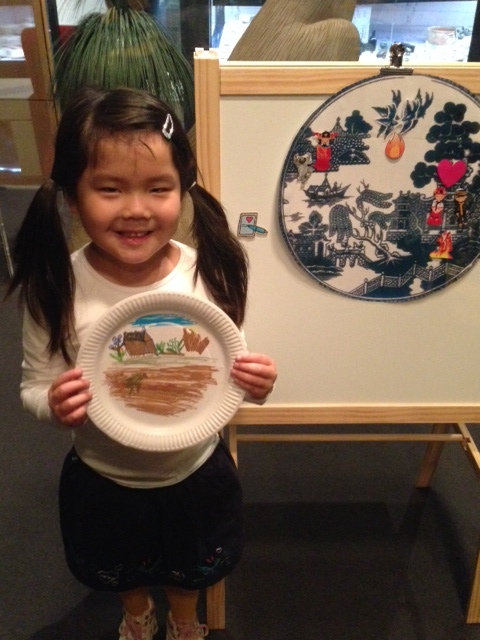 A girl shows off her completed plate.